This showed up as I’m lying in bed after a long (12 hour) drive up to Minnesota. 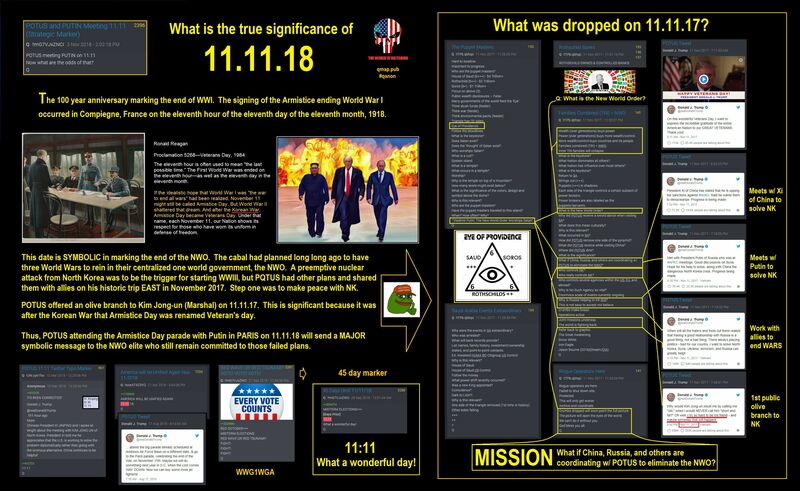 I’m only posting the links below, but especially check out the image, which an anon created to show what’s happened on 11-11 in the past, and now Trump is meeting with Putin on 11-11-18 (which is an 11-11-11) in Moscow. Clarifies many things, for me, at least. Remember the cabal intended to start three world wars, with the final one to cement in place “The New World Order”. 11-11-1918 marked the end of WWI. Now, on 11-11-2018, Trump meets with Putin on that same day, 100 years later. Talk about a Grand SIF (Slap In Face) for the cabalistas. This may be part of the reason I’m here now and why I’ve continually been receiving the communication that it is part of “ending a cycle” for humanity. Anyway, I had fun reading most of this one. Gallery | This entry was posted in apocalypse, cabal, energies, new energies, partners in contrast and tagged Neon Revolt, Putin, Trump. Bookmark the permalink.